The 2014 Ebola epidemic pitted a lethal virus against barely-there health systems, and it was always going to be deadly. But an Associated Press investigation has found that a string of avoidable errors badly undermined the work of international aid workers. The World Health Organization, charged with leading the fight against global outbreaks, already has been criticized over its management of the disease-fighting effort. Earlier this year, an AP investigation found that WHO delayed declaring an international emergency — similar to an SOS signal — on political and economic grounds. Newly obtained emails, documents and interviews show that WHO and other responders failed to organize a strong response even after the signal was issued. Experts say the bungling ultimately cost lives across West Africa. "There's no question that a better and earlier response from WHO could have resulted in thousands and thousands of fewer deaths than we saw," said Dr. Irwin Redlener, director of the National Center for Disaster Preparedness at Columbia University in New York. Kenema is a diamond town whose potholed roads turn to red sludge in the rainy season. Experts and insiders say the chaotic response there last year was a microcosm of the Ebola-fighting efforts across West Africa as the disease spiraled out of control. To date, Ebola has killed more than 11,000 people and officials estimate the epidemic won't be stopped before the end of the year. 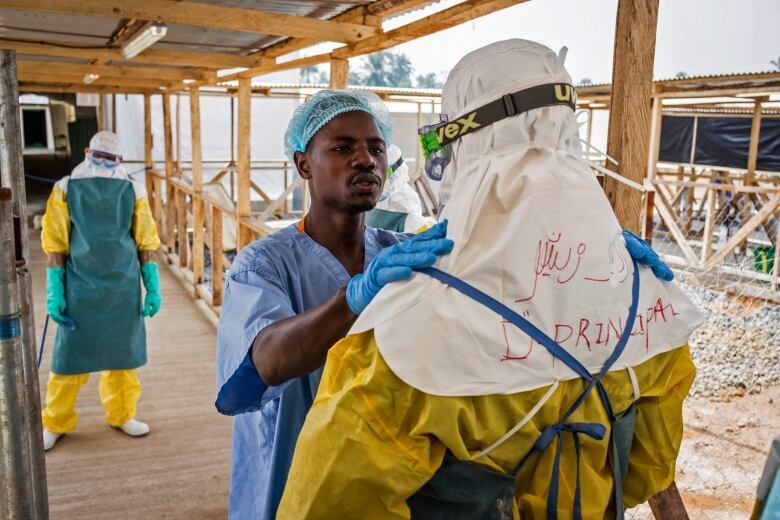 As Ebola cases climbed in July 2014, WHO's Director-General Dr. Margaret Chan identified Kenema as one of two priority areas. "Transportation, PPE (personal protective equipment) and other equipment must [be] provided," she wrote on the 24th of that month. But staffers regularly received expired or questionable chlorine, incidents that spooked an already rattled staff. Nurse Donnell Tholley said workers sometimes resorted to donning ill-fitting gloves for their hands and stray plastic packaging on their feet — instead of the tall protective rubber boots they needed. More than 40 health workers died and others abandoned the hospital out of fear. Joseph Fair, a U.S. disease expert in Freetown advising the Sierra Leonean government, described WHO as "paralyzed," recalling interminable conference calls debating things like the colour of body bags. The situation at Kenema Government Hospital was horrific — blood-drenched patients lay in agony in understaffed wards and WHO staffers made repeated requests for support that went unanswered. Other aid workers declined to work there, citing the dangerous conditions; there was virtually no triage and patients often were shuffled to the Ebola ward with incomprehensible slips of paper. When the Red Cross offered to build an Ebola treatment center to alleviate the pressure on the hospital, it was held up because no one in Sierra Leone's government or WHO could tell them where to build it. "We are at risk of very poor perception by the public when we send in IFRC [Red Cross] then block their ability to care for patients," WHO's Ian Norton wrote in a note to his colleagues. By the time the clinic was finally built, the peak of the outbreak in Kenema had passed. Twenty health workers were infected in the interim. Many patients who succumbed to the virus were buried in a cemetery behind the clinic, their graves marked with numbers instead of names. Dr. Bruce Aylward, WHO's top Ebola official, said it was common for Ebola treatment centres to be caught up in political wrangling. "Undoubtedly in some cases there was bureaucracy," he said. But he argued it was wrong to lay the blame at WHO's door. "These were government decisions at the end of the day," he said. Complaints about WHO leadership focused in part on Jacob Mufunda, the agency's top representative in Sierra Leone. Requests to fix critical problems like the hospital's shaky generator regularly went unfulfilled by Mufunda's office, leaving staffers to cover thousands of dollars' worth of expenses out of their own pockets, according to two people who were there at the time, speaking on condition of anonymity because they were not authorized to talk to the press. An email from Chan, WHO's top leader, which AP obtained, corroborates allegations of tight-fistedness, not just in Kenema but across West Africa. Chan told Mufunda and other senior officials that only a tiny fraction of needed cash was being released and that the problem had festered for four months. "I expect all our colleagues ... to facilitate experts and staff to do their field work and not to post barriers because business as usual does not work during crisis," she wrote. Mufunda, who was reassigned to run WHO's office in Mozambique shortly thereafter, did not return messages seeking comment. The problems that hamstrung the Ebola response have prompted soul-searching at WHO and across the public health community. Two months ago, a WHO-commissioned panel criticized the organization's lack of leadership but did not mention the logistical problems uncovered by AP. All of the top leaders at WHO during the Ebola outbreak remain on the payroll, except for its Africa director, who retired after serving out his term. That has left outsiders dismayed. "I personally would have no confidence that the same team at WHO would be able to handle the next international outbreak," said Redlener, the disaster prevention expert. "We've already seen what the old leadership at WHO has been able to do so I don't know why we would expect them to be able to right themselves."